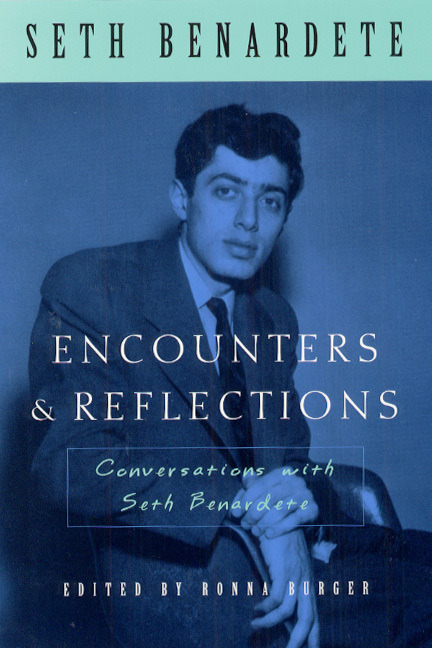 By turns wickedly funny and profoundly illuminating, Encounters and Reflections presents a captivating and unconventional portrait of the life and works of Seth Benardete. One of the leading scholars of ancient thought, Benardete here reflects on both the people he knew and the topics that fascinated him throughout his career in a series of candid, freewheeling conversations with Robert Berman, Ronna Burger, and Michael Davis. The first part of the book discloses vignettes about fellow students, colleagues, and acquaintances of Benardete's who later became major figures in the academic and intellectual life of twentieth-century America. We glimpse the student days of Allan Bloom, Stanley Rosen, George Steiner, and we discover the life of the mind as lived by well-known scholars such as David Grene, Jacob Klein, and Benardete's mentor Leo Strauss. We also encounter a number of other learned, devoted, and sometimes eccentric luminaries, including T.S. Eliot, James Baldwin, Werner Jaeger, John Davidson Beazley, and Willard Quine. In the book's second part, Benardete reflects on his own intellectual growth and on his ever-evolving understanding of the texts and ideas he spent a lifetime studying. Revisiting some of his recurrent themes—among them eros and the beautiful, the city and the law, and the gods and the human soul—Benardete shares his views on thinkers such as Plato, Homer, and Heidegger, as well as the relations between philosophy and science and between Christianity and ancient Roman thought. Engaging and informative, Encounters and Reflections brings Benardete's thought to life to enlighten and inspire a new generation of thinkers.